Continuing my issue by issue look back at the Mystifier, the newsletter of the Houdini Historical Center that ran from 1991-2003. 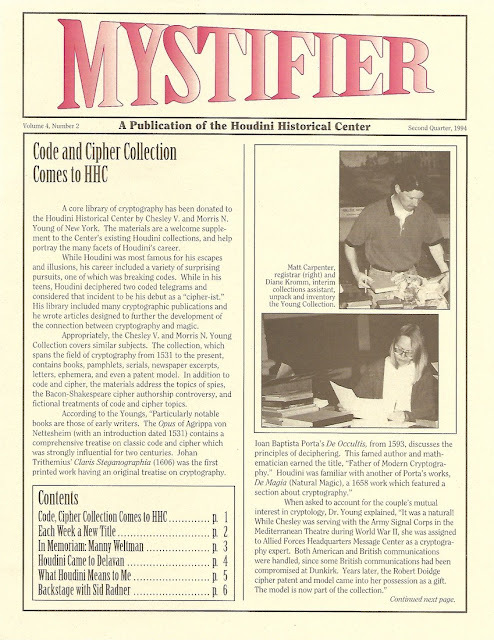 The Second Quarter 1994 Mystifier kicks off with the news that Morris N. Young has donated his collection of books and materials related to cryptography to the HHC. 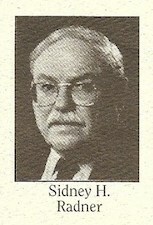 Young had penned and article in the Fourth Quarter 1993 Mystifier about Houdini's own fascination with the subject. An article by Arthur Moses about The Master Mystery follows. This piece originally appeared in the Texas Magic Collectors Newsletter. Samuel M. White (Weiss), age 86, passed away on April 4, after a battle with cancer. Samuel was born in New York in 1908, and was named after his grandfather, Rabbi Samuel Mayer Weiss [sic]. The son of William Weiss, Houdini's brother, Samuel was the last of the second generation of Houdini's family. A a young man, Samuel attended medical school and became a cardiologist. His schooling was sponsored by another Weiss brother, Leopold. The young Samuel Weiss changed his name to "White" when he joined the United States Army. Samuel was known to have been very fond of his uncles Theo and Ehrich (Houdini). As Manny Weltman, an acquaintance of Samuel's, recalled during a May phone interview, "Samuel said that throughout his childhood, he always referred to Houdini as 'Uncle Houdini,' never 'Uncle Harry' or 'Uncle Ehrich'." Samuel also remembered fondly an occasion upon which Houdini gave him a military outfit. The young boy would march for and salute his "Uncle Houdini." We extended our sympathies to his wife, Barbara. A very good article from the 1989 Delavan Enterprise by W. Gordon Yadon about Houdini's connection to the Flitcroft family of Delavan follows. The Flitcrofts famously took in the 12-year-old "Harry White" during his runaway days. The article includes a letter, reproduced in full, that Houdini wrote to Mrs. Flictcroft in December 1907. It also states that their house at 328 S. Sixth Street is still standing! Benjilini contributes a fine article called "What Houdini Means to Me," which includes a poem by 11-year-old Yaniv Amar, a member of The Great Benjilini Society of Young Magicians, Assembly 33. In "Backstage with Sid Radner," Sid tells the story of Mario Cockrell who saved 20 trapped miners in South Africa by using a trick "he had learned from a book by Houdini." Cockrell was able to make his body rigid, creating a bridge that allowed the miners to cross to safety. Sid says, "Of course, all Houdini buffs know where Houdini described this stunt." Do we? Miracle Mongers and Their Methods, I'm guessing? Sid then reports on the annual Magic Collectors Convention, held this year in Eureka Springs, Arkansas. "Houdini items disappeared first, as always." He then reflects on the sad news of Manny Wetlman's passing, and thanks Arthur Moses and Benjilini for their contributions to the newsletter. He finishes with his usual sign off: "Houdini Lives!" If memory serves, the "Handcuffs, Chains and Leather Restraints" poster was part of a series of 3 posters of similar graphic design that the HHC sold. There was another of Houdini performing an USD straight jacket escape, with the caption, "And you thought you were trapped in your job!" At the moment, I can't recall what the third poster said (or where I've stored mine!) They were fun and unusual. Thanks for the memories. Yes, that's right. Now that you mention it, I remember the straitjacket one as well. I also forget what the third was. I never had the posters themselves, but I think I have the images on cards. I'll see if I can dig them out. Might make a nice post. Yes indeed. At the time (pre-internet days), it was a cool and interesting way to draw attention to the Center and to Houdini. 1899: Harry and Bess entertain at Manufactures Association banquet in Kansas City.